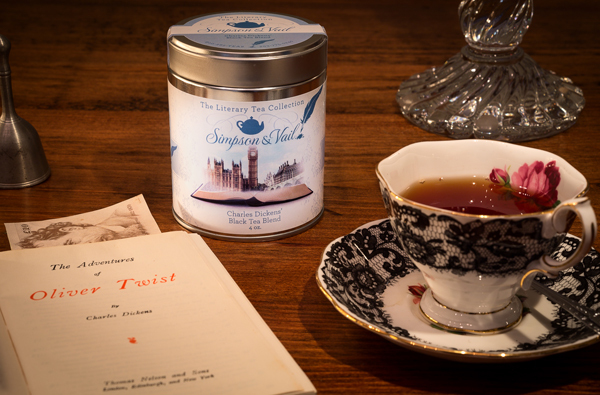 The Literary Tea Line is here! To introduce this brand new collection of tins, we’ve written a series of blogs that will provide both a short biography for each of the authors we’ve been inspired by and an explanation for how we decided what goes into their blend. Each of these authors provided unique challenges and we did our best to make sure that our tea blends captured their individuality. The scents and flavors of these blends will transport you to the cities and countries that your favorite characters knew and loved. Curl up with your favorite book and enjoy a cup of tea inspired by the life and works of its author. This week, our blog will focus on an introductory set of authors with whom everyone’s already familiar. They represent some big names in the literary world and everyone with even a passing knowledge of literature is sure to have heard of them. Gardens, herbs, and flowers appear in many of Shakespeare’s plays and oftentimes play a critical role in his stories. Our William Shakespeare tea blend is a combination of a few of the many herbs he references: lavender, roses, rosemary. The wit and playfulness of his verse means that Shakespeare’s plays can still be enjoyed today, ideally with a warm cup of tea. This black tea blend brews to an amber cup with a sweet, floral taste. The slightly earthy and woody notes are rounded out with the citrus taste of bergamot and sweet rose petals. From Shakespeare we move onto another one of literature’s biggest names: Jane Austen. She was born on December 16th, 1775 in Steventon, a rural village in north Hampshire, England. After receiving her primary education at boarding school, Jane returned home where she and her older sister Cassandra would spend long hours in their father’s library reading the classics and writing their own stories. Jane had a close relationship with her father and he encouraged her creativity by supplying her with all the paper and writing utensils she desired. She had completed early versions of Northanger Abbey, Sense & Sensibility, and Pride & Prejudice by the time she was 23. In 1811, Jane’s first novel Sense & Sensibility was published and met with immediate success. Only four of Austen’s six novels were published in her lifetime. Northanger Abbey and Persuasion were published posthumously. Sense & Sensibility was credited “By a Lady” and Pride & Prejudice was credited to “The Author of Sense & Sensibility.” Jane Austen’s novels illuminate the everyday lives of young women in the early 19th century and blend contemplative pastoral prose with witty banter and intriguing romance plots. Besides writing, she was an avid gardener who tended to her own plants late into her life. The delicate prose of Jane Austen’s novels is evoked in this blend that combines peppermint with a gentle touch of vanilla. Lavender flowers, which look lovely in both the cup and the gardens around Jane Austen’s estate, add a sweet floral taste that complements the mint and vanilla wonderfully. This blend captures the color and joy of Austen’s characters while taking inspiration from the herbs and flowers she cultivated in her own garden. It brews to a refreshing cup with a cool mint flavor that’s softened by the warm vanilla and the sweet lavender flowers. Jane Austen’s novels showed a side of English society that was very different from the one our next author, Charles Dickens, experienced. Unlike many of his characters, Charles Dickens was born to loving parents in February of 1812. However, when he was only 12, his father was imprisoned for debt and Charles was sent to work in a blacking factory where he labeled endless bottles of shoeshine. He would leave the factory four years later to finish his education, but those formative years deeply affected him and inspired many of the boyhood horrors he would later write about. He wrote many of his most famous novels like Oliver Twist and Nicholas Nickleby episodically, with a new chapter appearing in a magazine each month. These works examined the lives of the less fortunate and found humanity amid the most inhuman conditions. In 1836, he married Catherine Thomson Hogarth. They had ten children together and named three of them after literary figures: Alfred Tennyson Dickens, Henry Fielding Dickens, and Edward Bulwer Lytton Dickens. He also gave each of his children nicknames such as Lucifer Box, Plorn, Young Skull, Skittles, and Chickenstalker. In his country house, Gad’s Hill Place, Dickens’s study had a secret door in the form of a fake bookcase. The fake books on the shelf included titles such as ‘The Life of a Cat’ in 9 volumes, Five Minutes in China (3 volumes), Forty Winks at the Pyramids (2 volumes), and many more that Dickens invented. Tea appeared in Dickens’ work as a calming force like in David Copperfield, when the main character recounts how he “sat swilling tea until [his] whole nervous system, if [he] had had any in those days, must have gone by the board.” Or it could surface as a commonality between classes that allowed Dickens to emphasize their stark differences. While a “real solid silver teapot” and “real silver spoons to stir the tea with” are listed among the treasures of Old Lobbs in The Pickwick Papers, “a regular place of public entertainment for the poorer classes” described in Oliver Twist would provide “a public breakfast, dinner, tea, and supper all the year round.” Our Charles Dickens blend adds a flash of color to a traditional British tea. The blend is a hearty, well-rounded blend of Chinese and Indian teas that brews to an amber cup with a light currant after-taste. Keep an eye on the blog for more author introductions in the coming weeks. We’re super excited about the research we’ve done and are eager to share it with you. This line is the result of months of hard work and it’s both a relief and a pleasure to finally release it for your enjoyment. A former student of English and Creative Writing, Connor now spends his days doing whatever is needed of him in Simpson & Vail's warehouse and his nights writing.